The Castilla project was initiated by MPX/E.ON, a joint Brazilian-German venture aiming to construct one of the biggest and most polluting thermal power stations in Latin America. The project also involves the development of an associated port to supply fuel (coal and diesel) for the operation of the thermal power station. Planned for northern Chile, the plant aimed to supply energy mainly to the mining industry. Both projects requested environmental permits separately and several irregularities and pressures from the government in the approval process of the Environmental Impact Assessment (EIA) of the projects were denounced. Local farmers, fishermen, EJOs and congressmen actively opposed the project because of the negative impacts it would bring for health and the environment. 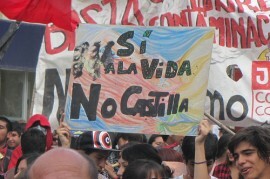 Legal measures were undertaken and the Supreme Court unanimously ruled against the Castilla project, stating the port and the thermal power plant needed to be evaluated together, and reaffirming the constitutional right to live in an environment free of pollution. Project Details The thermal power station would have produced 2354 MW of energy. More than 21 million m3 of ash would have accumulated over 20 years. More than 280,000 m3/h of sea water would have been extracted and a large proportion returned with a temperature 10oC higher. More than 1,300,000 m3/h of greenhouse gases would have been introduced to the atmosphere. For the thermal power station - CGX Castilla Generación S.A.
For the maritime port - OMX Operaciones Maritimas Ltda. Why? Explain briefly. After several social mobilizations and the use of legal avenues, the project was stopped by the Supreme Court. This case is emblematic for several reasons, as the ruling prioritised the precautionary principle, making a decision before damage could be caused by the industry, and deciding for the first time in favour of the constitutional right to live in an environment free of pollution.